Mushroom Brew is a duel minigame found in Horror Land in Mario Party 2. Characters have to press buttons as they appear on the screen. Pressing the correct button place a Mushroom into the brew. In the end, the player with the most mushrooms in his or her pot mixes them to create a star. 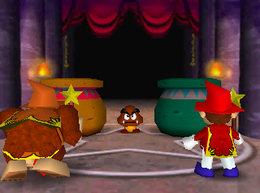 The player with the star does not keep it, but wins the duel and the amount of Coins agreed before the duel began. If both players have the same number of mushrooms in their mixes when time runs out, no star is created and a draw is declared, thus forcing the game to restart. "Stew the best mushroom brew by putting the proper ingredients into the pot. There are 3 types of mushrooms. Add them in the order Goomba tells you, and don't delay! Press the Button for blue, the Button for green, and the Button for gray mushrooms." This page was last edited on May 23, 2018, at 21:49.